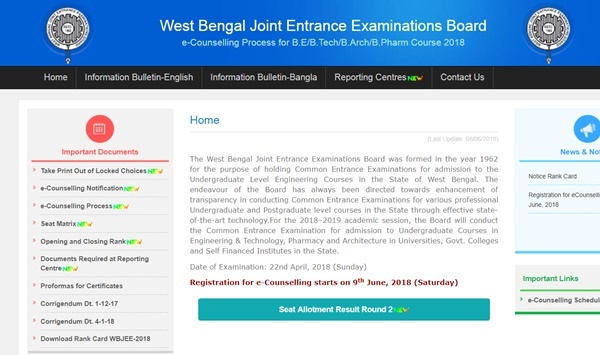 WBJEE 3rd/ Third Round Seat Allotment Results 2018: West Bengal Joint Entrance Examination Board announced the WBJEEB third Round seat allotment results on its official website today on 4th july at wbjeeb.nic.in. Candidates eagerly waiting to check the WBJEE Seat Allotment result can immediately switch to the official portal to check the result. Students have to login with the registration id and password to check the WBJEE Provisional seat allotment round 2 list 2018. The West Bengal Joint Entrance Examination Board (WBJEEB) has conducted the admission test on 22nd April for admission to B.Tech, BE, and B.Pharmacy courses. The board has also declared the results on 5th June. And also, qualified aspirants have registered for the counselling. The WBJEE has stated the facility for online filing from 9th June and the Second-round seat allotment announce on 27th June. Candidates who are allotted seats in first round will have to pay the provisional admission fee online and personally report to any one of the Reporting Centres for document verification and seat confirmation/ up-gradation. All candidates who get allotment must report at the Reporting Centre positively during the first round of ecounselling, failing which their allotted seat shall stand cancelled. Moreover, they will not be considered for further online rounds of seat allotment. Third round seat allotment result published based on vacancy status of Second round of reporting. There will be no fresh registration and choice filling in third round of counselling. All candidates who get first time allotment in second round must report at the Reporting Centre positively during the second round of e-counselling. Otherwise, their seat allotment shall stand cancelled. Also, they will not be considered for further online rounds of seat allotment. Search for the ‘Seat Allotment Result Round 3’ link on the homepage. The WBJEE 3rd allotment list appears on the screen. When (time) wbjee seat allotment result round 3 is released? When ( time ) wbjeeb seat allotment letter round 3 2018 is release ? When 3rd counseling results will published? it will available today. wait for it ! the payment of 5000 rupees is paida only to be once or often after every round of coumselling?? I can't find my wbjee 1st counselling result. How can I get it?